Time for some couch surfing again. Found a really cool guy to stay with here in Zurich. He's also studying engineering, so he showed me around Zürichs technical university, and I am VERY impressed. The campus is damn huge and everything is really, really neat. All chromed steel and glass walls, carbon-hexagon carved into the roof, DNA-helix for a staircase in the chemistry building. I thought Lund was pretty big, but this I just insane. And everything looks just newly built and super fresh. The study environment here is just crazy good, really. He also took me on a biking trip around large parts of Zurich: up in the woods, down to the older parts, through the Red Light district. It was awesome, getting some work done and some fresh air. Not just breathing in city fumes all the time. And then there the town, the gate to the alps. In itself, the town is rather quite nice. Scores of old medieval houses, framing the many narrow, winding streets of the old town. 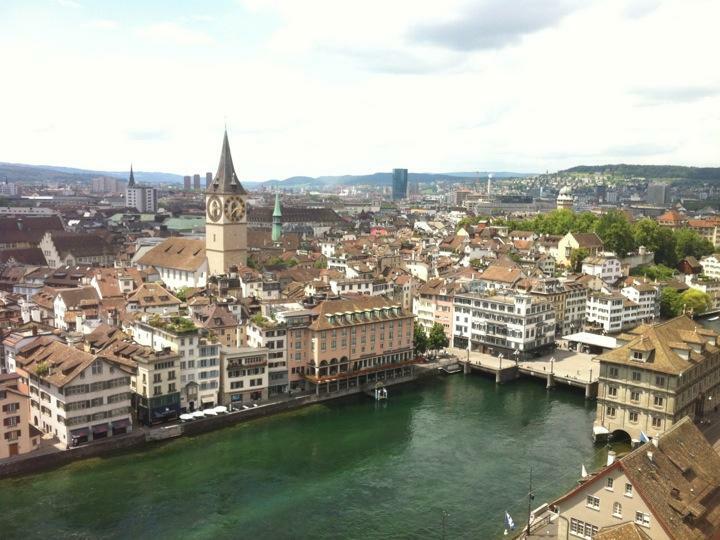 The famous Grossmünster overlooking the city center, offering a perfect view of the town if one chooses to climb the stairs to the tower. Still nothing compared to St. Paul's Cathedral in London, but good nonetheless. Also, the money is running quite thin here. Switzerland is like the most expensive place I've ever been to. Would love to buy tons of chocolate and Swiss cheese here, but I can barely afford any sort of food, even whilst couchsurfing. Oh yeah, first thing I did in Zurich: ate some raclette of a street market. These guys don't skimp on the cheese... Loved it though. Think I prefer the German kitchen to the French. A lot more "proper", heavy food.